« “And that’s goodnight from us”: Challenges to public service media in a culturally diverse Europe. A new Australian Multicultural Council signals a firm shift to the Right in government policy advice. Under the Coalition Government Multiculturalism is now solely the concern of the Social Services portfolio, hanging out tenuously under the guardianship of the most junior member of the Ministry. Moreover it is now located in the heartland of a very conservative enclave in the Liberal party, renowned for its connections historically to right wing Eastern European revanchist groups, hardly likely to be modified by the evangelical fervour of the new Minister Scott Morrison. Late in December I took a phone call from a young woman working for the Department of Social Services. She had called, she said, because the Department was checking its database of contacts, so that the Minister and the Parliamentary Secretary could improve their engagement with the multicultural community. Two days later the politicians thus identified jointly announced the membership of the Australian Multicultural Council, which for six months had existed with no members (its “sister” body the Refugee Resettlement Council is also an empty shell since June 2014, with a promise it will be updated in early 2015). The new AMC has become a slimmed down and rather more ideologically acceptable group than the former team, which had been allowed to lapse in July 2014. After a long struggle with the Prime Minister’s Office the Minister and PS had managed to save a Council with six members from the crash and burn of dozens of other advisory groups abolished by the Government. Gone were the ex-officio representation by Secretary of the Department of Social Services and the Race Discrimination Commissioner. The new chair would be a former Howard-era Human Rights Commissioner Dr Sev Ozdowski, a conservative Polish nationalist, who had been the only public figure from the “multicultural community” to fulsomely endorse Attorney General Brandis’ declaration of the end of racial vilification legislation (18C) and to support Andrew Bolt’s campaign, in the name of the right to bigotry, earlier in 2014. Of the six members, two have Muslim backgrounds and one is Jewish. One is Indian Tamil Hindu, a property consultant, and founder and chairman of the Victorian Multicultural Liberal Business Club. The youth member, a Victorian lawyer, is best known for her ultimately unsuccessful bid for Masterchef status in 2013. One member is a multimillionaire from the hospitality and property development industries. Her family company donated $25,000 to the Liberal Party and $20,000 to the ALP in 2010-2011. So what “narrative” emerges from the appointments to this Council? Three members (half) are from the then Minister Kevin Andrews’ hometown of Melbourne, two are from Sydney, in Senator Concetta Fierravanti-Wells’ state of NSW. One is from Adelaide. Three are of West or South Asia background (all from Melbourne), three are Europeans (two from Poland), while none are from North, East or South East Asia, none from Africa or the Americas. Half are well established “multicultural industry” figures – the Chair who has been in government and in education, the CEO of the Australian Multicultural Foundation (the only carry-over from the former Council), and a deputy chair of the national lobby body FECCA. Half have close links to the Liberal Party (as members or long term supporters), enough to ensure no proposed advice critical of the government could usually achieve a majority. Announcing the Council Mr Andrews said it, “will advise the Government on ways to sustain and support socially cohesive communities, to ensure all Australians have the opportunity to participate, engage and contribute to Australian life.” Under the previous government the Council membership was drawn from a public call of expressions of interest. Even so the Minister’s office of the time played a key role in shaping those who would be short-listed and ensuring that a very Muslim-linked Council would be appointed. This time around there was no public call, and the appointments process was even less transparent: there was nothing there that might lead an observer to find evidence of “opportunity to participate” being extended much beyond the hand-picked political circle of the conservative wing of the Liberal Party and their donors. The former AMC was the chief advisor to the current Government during the 18C changes, and its submission pilloried the process and content of the Government’s actions. The new AMC has been designed to ensure it neither can nor will want to confront the Government’s right wing ideology during its term of office. This lack of transparency and reshaping of the multicultural advisory landscape has been proceeding doggedly under the Government. Two Indians were appointed to the Board of SBS (including the Chair) and in NSW the Baird government also appointed an Indian as the replacement chair of the Community Relations Commission, now rebadged as “Multicultural NSW”: one third of the new AMC is South Asian. While it is hard to gauge the depth of intentionality, it appears in the Asian century that for the Abbott and other Liberal governments Asia is increasingly India and Pakistan, and decreasingly China. It may have something to do with cricket. If we examine what the Abbott government has done in relation to the broad multicultural agenda, we need to distinguish between things that were on its agenda but have failed (as yet) to be achieved, and things that have moved forward with serious impacts on relations and opportunity in multicultural Australia. 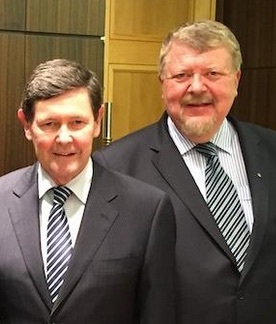 Key failures that had they succeeded would have been seriously deleterious, include the attempt to remove Racial Discrimination Act Section 18 sanctions on racial vilification, the closing down in toto of family reunion visas for parents, and momentarily, the isolation of veiled women in security boxes in Parliament. “Successes” include significant cuts to the funding of SBS, the reintroduction of parent visas with a waiting time of over fifty-five years, “stopping the boats” and the continued punishment of asylum seekers for their temerity in seeking refuge, swingeing and increasing cuts to the Human Rights Commission and its work on racial vilification, a further Whitewashing of the National Curriculum, and an increased marginalisation and castigation of Muslim Australia as a deviant segment of the society (exemplified by blaming the abandonment of 18C rescission, on Muslims – who as a religious group ironically do not have protection under the race-only provisions of 18C). As well government support for research on social cohesion has been truncated, both through cuts to the Australian Research Council and through cuts in supported research by government departments (try making sense of the DSS publications website as a case study in turbidity. While multiculturalism and settlement services were not heavily targeted in the May 2014 Budget, there are sector fears that the new Minister Morrison will re-visit this zone given the major cuts to welfare advocacy organisations announced just before Christmas. Three key challenges continue to confront national government (of whatever political flavour) in relation to social cohesion and multiculturalism: national legislation (all the states already have their own version and have had for decades) that locates multicultural concerns at the centre of Government; a more extensive empirically-informed conversation about the development of Australian diversity supported by independent research; and sustained action around media representations of cultural diversity as a key driver of social cohesion and identification with a representative and culturally-diverse “Team Australia”. While there may be little current appetite in Government to re-run the 18C debacle (despite Institute for Public Affairs and Family First enthusiasm), there remains no sense of a government for whom these multicultural issues are anything other than marginally symbolic, or one which might risk the fragile remnants of its political capital on advancing them. There are a number of positives about the new Council, clearly the result of work by Senator Fierravanti-Wells. Half the members are women, reflecting her commitment to issues affecting immigrant women’s well-being, such as domestic violence. The appointment of Dellal and Kyriazopoulos, both highly respected professionals associated with leading apolitical NGOs, points to an awareness that there needs to be serious and fearless advice available, even if it is not followed. The survival of the Council at all must be seen as a significant victory in the face of the razor gang of economic rationalists, and the IPA ideologues for whom multiculturalism is an anathema. Fierravanti-Wells was also careful never to line herself up too publicly with the Brandis/IPA push to kill 18C, and she applauded Abbott’s abandonment of the exercise: it is her phrase that there is currently “no appetite” for pursuing this issue. This entry was posted on January 4, 2015 at 9:36 am and is filed under Uncategorized. You can follow any responses to this entry through the RSS 2.0 feed. You can leave a response, or trackback from your own site. Does the Australian Multiculturalism Council have a charter? How can the checks and balances be put back in? This is what the website (http://www.amc.gov.au/) says, so it’s fairly much at the beck and call of the Minister, but it can be held to account by citizens to fulfil its role as an avenue of advice to government. Perhaps different community groups could each “adopt” a member of the Council to ensure that the six members get to hear personally the concerns and insights of the communities. Harnessing the economic and social benefits of Australia’s culturally diverse population. Celebrating diversity, promoting social acceptance and fostering engagement with Australian values, identity and citizenship, within the framework of Australian law. Building stronger and more cohesive communities and addressing barriers to participation, including racism and discrimination. Empowering civil society through partnerships with the business sector and harnessing the experience of established communities in developing the capacity of newer communities.